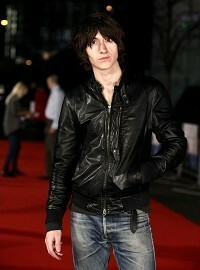 Alex Turner and his Arctic Monkeys brought a touch of rock cool to the London premiere of Submarine. The Sheffield band, who created the film's soundtrack, were on hand to support Alex's friend, Richard Ayoade, as he made his directorial debut. As band members Jamie Cook, Nick O'Malley and Matt Helders sneaked past reporters at BFI Southbank, Alex dished out praise for the film, saying: "I've seen it a couple of times and I love it; I think it's a special film - the actors are all terrific." The 25-year-old, who hit the carpet without girlfriend Alexa Chung, revealed he wasn't tempted to make an appearance in the coming-of-age drama. "Richard kept telling me how I look a bit like the lead actor Craig Roberts so I did a cameo in a way," he said. Alex, who had worked with Richard as he directed Arctic Monkeys' music videos Fluorescent Adolescent, Crying Lightning and Cornerstone, said the soundtrack process was quite natural. "I didn't see this as a soundtrack because it's my songs on there. I just wrote some tunes and played them to Richard, and he liked them. They just happened to fit. I tried to make good recordings and not try to spoil the movie," he said. Based on the novel by Joe Dunthorne, Submarine, which also stars Sally Hawkins, Paddy Considine and Noah Taylor, is released in cinemas on March 18.